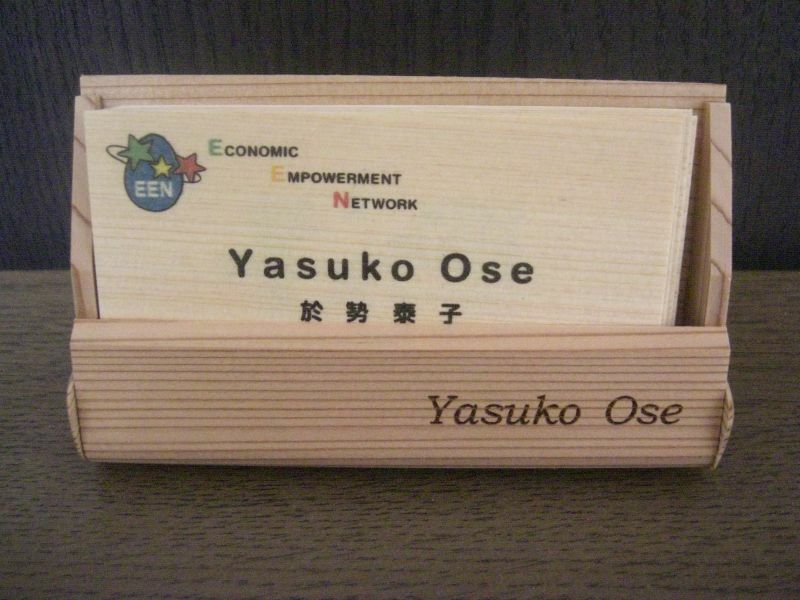 The business cards are made of Japanese cypress; the business card holder is made of Japanese cedar. ECOASU Umaji-mura is a local small/medium-sized enterprise (SME) in Umaji Village in Kochi Prefecture, Japan. According to the census (as of December 1st, 2014), 909 people live in the village. Located in a mountainous area, about 96% of the village is covered with forests. Generally, cutting down trees is considered bad for the natural environment. However, this is not necessarily true. Trees in a forest need to be cut down adequately in order to preserve the forest. Tree density management is important to maintain the sound eco-system in the forest. Trees are proportionately thinned out in Umaji Village. In Umaji Village, the trees which are thinned out from a forest are processed by ECOASU Umaji-mura. The company has created a variety of products from that timber. Part of the sales from the products is spent on forest preservation in Umaji-mura. That means EEN has contributed to forest preservation in Umaji-mura. 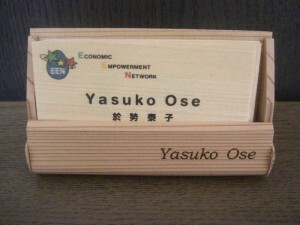 As the face of EEN, I am on the back side of my mom’s business card saying, “Let’s BEAR! Be Empowered with Available Rewources!” That means I have also contributed to forest preservation there. Ha, ha, ha! If you want to see more products of ECOASU Umaji-mura, click below!